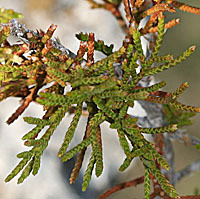 Dwarf Juniper, Juniperus communis, growing in sagebrush grassland not far from Taylor Creek, upstream of Almont, Colorado ,elevation 8,400 Feet, July 20, 3007. 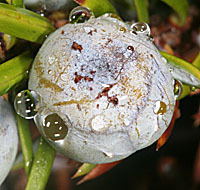 Berry diameter is 7 mm. 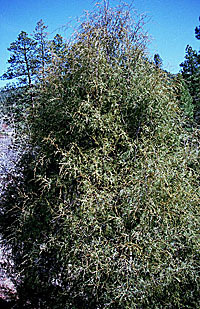 One Seed Juniper, Juniperus monosperma, North facing slope above Frijoles Canyon Falls, Bandalier National Monument, New Mexico, 5,800 Feet, August 17, 2007. 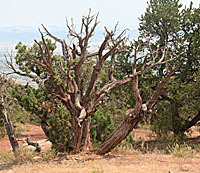 This tree is scattered on both the north and south facing slopes of this narrow canyon. 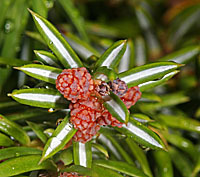 Trunk up to a meter in diameter for larger trees, bark very shreddy, leaves/scales about 1 mm long, berries 6 mm in diameter. 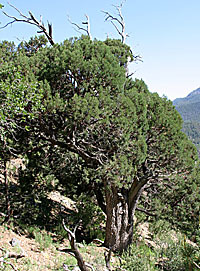 Substantial Rocky Mountain Juniper on flats above Taylor Creek near Almont, Colorado. 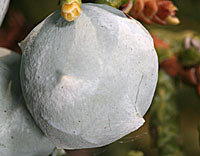 Berries are 7 mm in diameter, small trunk diameter is 2 inches. 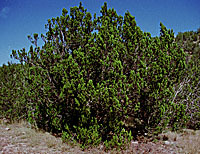 Utah Juniper, Juniperus utahensis, growing at Colorado National Monument, Saddlehorn Campground, 5,650 Feet, July 7,2007. 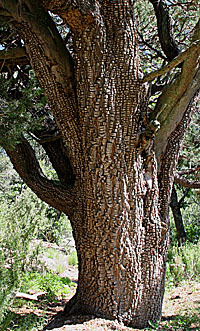 Trees over 12 feet tall, but that may be about average height. 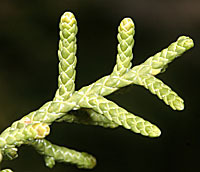 bark of even smaller trees in long strips, Berries glaucous, width 10 mm, scales abou t2.5mm long. 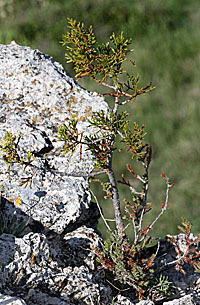 Juniperus virginiana, Eastern Red Cedar, a dwarf tree growing on a bluff above Wray, Colorado, elevation 3,700 feet, June 9, 2007.